Quality design, graphics and decorations will make a great first impression and give your presentation or other project materials the introduction they deserve. Vinyl binders in multiple sizes, shapes, materials and decoration techniques are available for quick production. Options include screen-printing, foil-stamping, embossing and debossing, as well as colored rings, padding, pen loops and many other features to meet your specific needs. 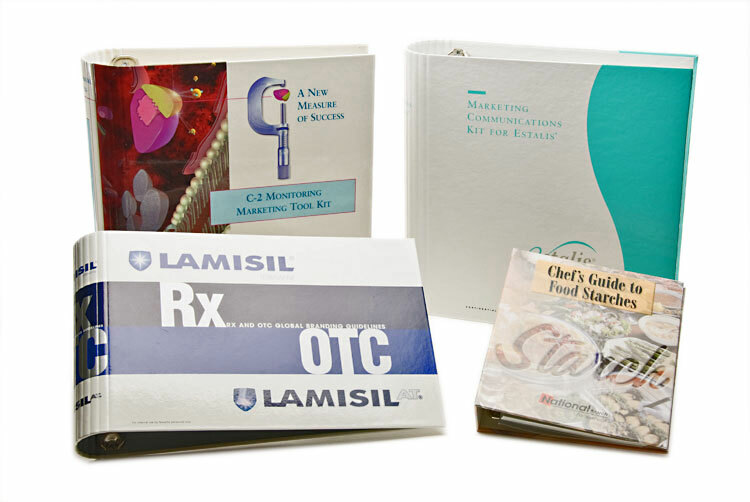 When a sophisticated graphic presentation is required, these four-color process vinyl binders and litho wrap casemade binders offer the perfect solution through offset printing quality. Full color digital printing is a great alternative for small quantity projects. 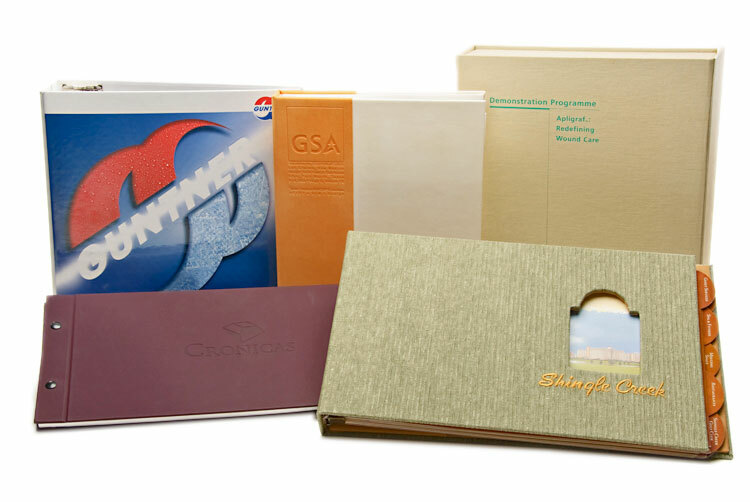 These beautiful and durable turned edge binders are made in the same way as hard bound books and can be custom covered with fine book cloth, coated papers, litho printed sheets and other specialty coverings. Square back, rounded or scored "Euro-Style" spines are available. Paired with a slipcase, these sets create a professional finished package for manuals, reference materials and high-end promotional materials. Perfect for many applications, these designer friendly one-piece plastic poly binders are durable, flexible, temperature-proof and waterproof. Available in light weight and heavy duty options, these binders are ideally suited for industrial, educational or recreational applications. 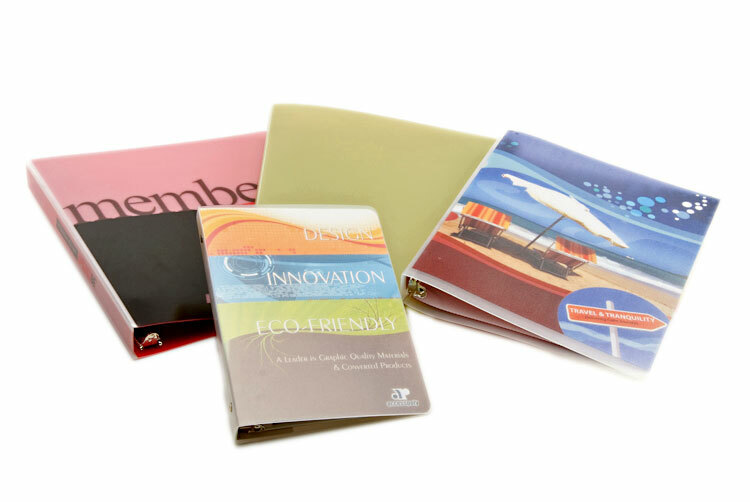 Poly binders can also be made from 100% Post-Consumer Polyethylene - a more eco-friendly packaging solution. 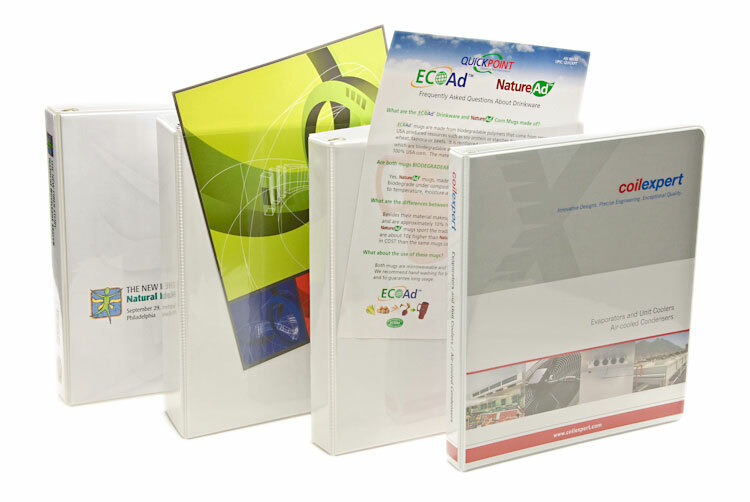 Ask about the STOCK 100% Post-Consumer binders and Folders and visit our eco-friendly products page. Choose one of our stock clear overlay binders or have us produce a custom binder for you. With digital printing capabilities, we can be your one-stop shop for the overlay binders and the custom printed insert sheets. 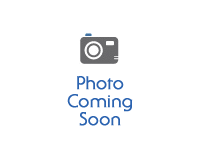 We also provide encapsulated binders, which feature printed sheets completely sealed under clear vinyl with the appearance of full color graphics printed directly on the binder. Available in numerous paper stocks, paper board film laminated binders are economical while allowing for a broad range of creative presentations. Decorating options include foil stamping and debossing. Offset printed graphics are enhanced using one color to four color processes and film laminating. Both light weight and durable, a paper board film laminated binder creates the perfect first impression for your company. 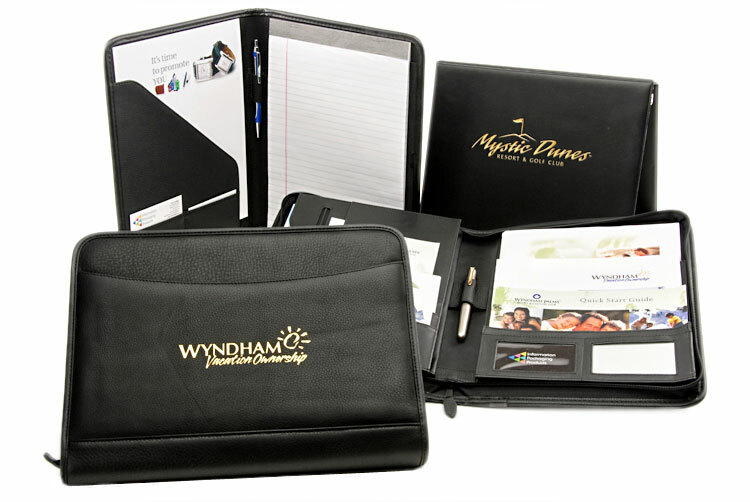 Custom and stock leather products are extremely desirable as high-end and executive presentation products. Ask about our numerous decorating techniques that will further enhance the impact of these products. Metal and acrylic binders provide the ultimate in style and protection for your loose leaf work, presentation and other packaging needs. Ranging from industrial use to an edgy, high impact presentation, these materials make a strong and lasting impact for your next presentation or marketing project. Our decorating processes include screen printing, laser etching or embossing. We also offer other metal products including tote boxes, CD/DVD cases, and clipboards. Many color and size options are available. 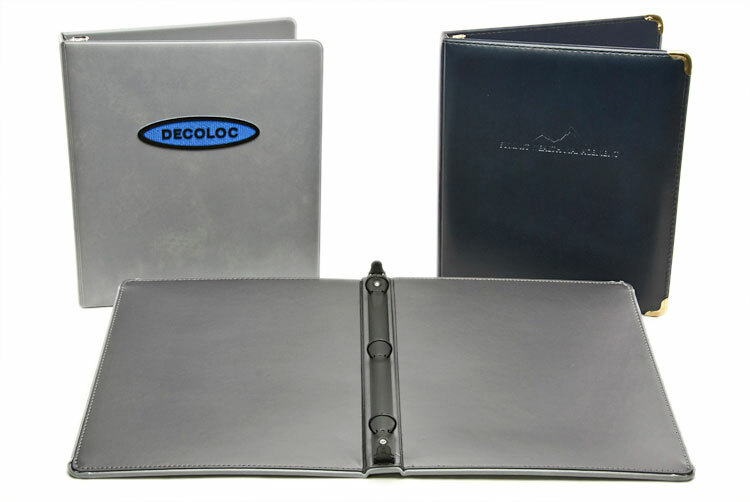 Executive style binders are upscale, elegant and durable. Expanded and supported vinyls are used with turned edges and sewn or sealed with stitching construction. Brass or nickel metal corners can be added. With cut and seal construction and the same materials, we can offer binders with high perceived value at a reasonable cost. 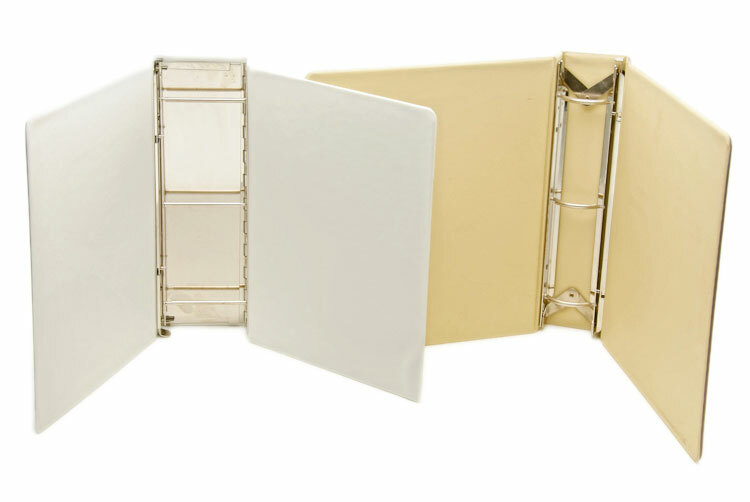 Easel binders are perfectly suited for point-of-purchase and one-on-one sales presentations. Easels stand freely and also fold up for easy storage on a shelf or neatly inside for safe-keeping when the presentation is over. 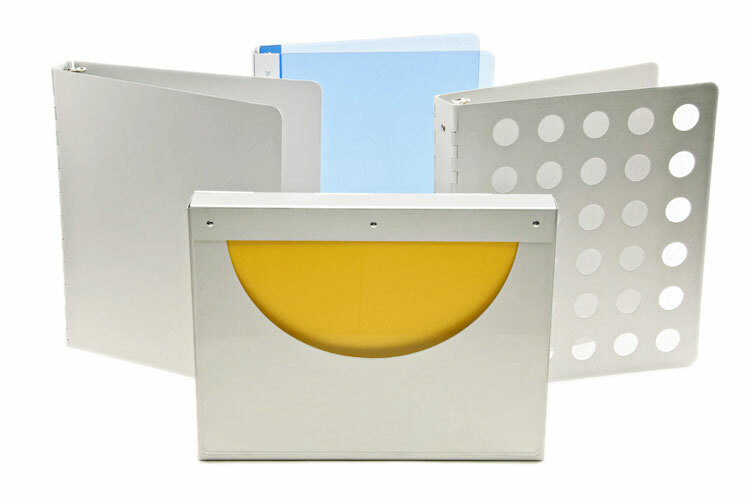 These binders can be produced in many different sizes, materials and decoration options. Heavy duty construction and special binding mechanisms are ideal for large capacity uses, such as catalogs, parts books and sample presentations. 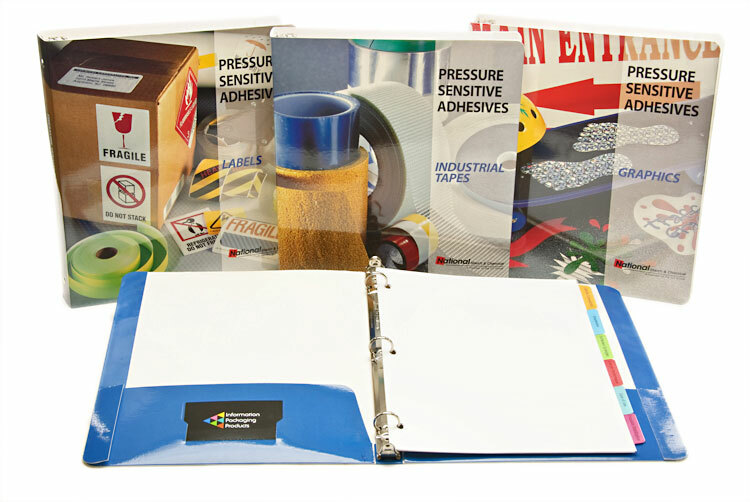 These durable binders can be made from vinyl, poly and turned edge materials. 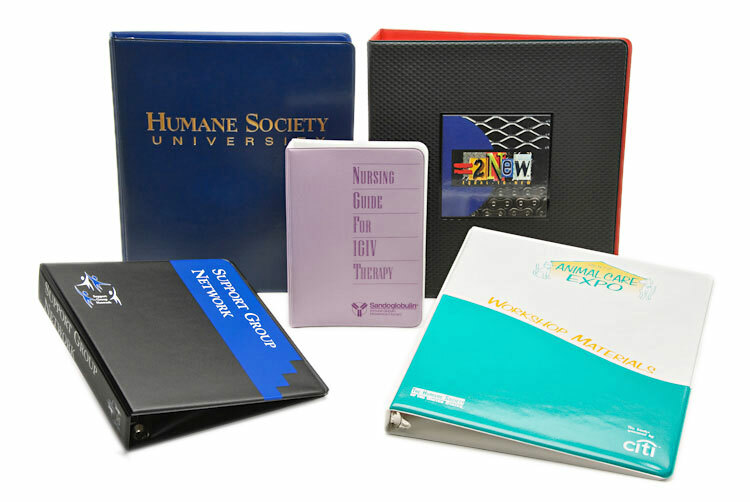 Turn and sewn custom binders are used to reach people with discriminating tastes, making an effective impression on executives and corporate customers. 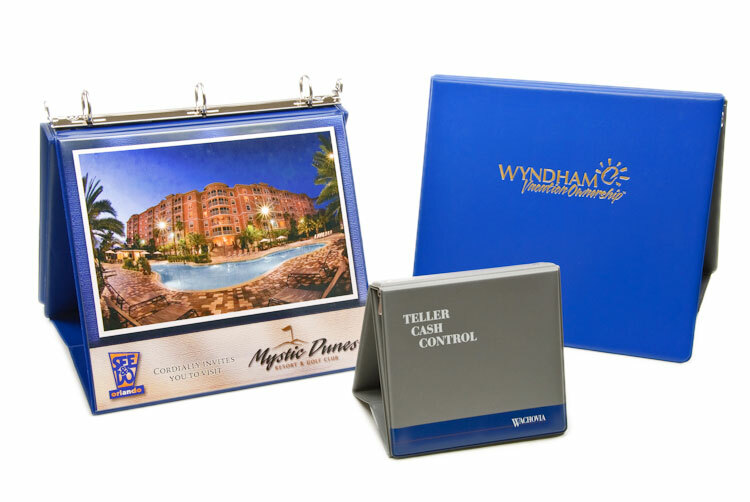 They also serve well for resort directories, catalog binders, menus and more. With the rich look and feel of leather, expanded supported vinyl is a unique vinyl product ideal for debossing and embossing. The supportive fabric backing adds both strength and durability. Consider this option to make an "executive" quality presentation, or when a traditional experience is desired.